Breech was successful on 50 of 80 field goal attempts in college, including 30 of 34 inside of 40 yards, and received All-Pac 8 honors in 1976 and ’77. He was chosen by the Detroit Lions in the eighth round of the 1978 NFL draft, was waived during the preseason, and then caught on with the Oakland Raiders in ’79. Breech was successful on 18 of 27 field goal tries and 41 of 45 extra points, but was again cut loose the following year. He signed on with Cincinnati during the 1980 season, the club’s third placekicker of the year, and while he appeared in just the last four games and kicked four field goals in seven attempts, two of them came in clutch situations. Bengals went 12-4 to finish first in the AFC Central with the conference’s best record. Won AFC Divisional playoff over Buffalo Bills (28-21) and AFC Championship over San Diego Chargers (27-7). Lost Super Bowl to San Francisco 49ers (26-21). 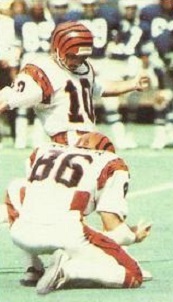 Breech went on to spend a total of 14 seasons with the Bengals. While not having great range, he was generally reliable inside of 40 yards. He co-led the AFC in field goals with 24 in 1987 and appeared in a second Super Bowl following the ’88 season. Over the course of a career that ended after the 1992 season, Breech kicked 243 field goals in 340 attempts (71.5%), with a franchise-record 225 in 313 tries coming with Cincinnati. Adding in 517 extra points, he accumulated a total of 1246 points. His 1151 with the Bengals also constitute a team career record, and he added another 9 field goals and 52 points in the postseason.